The US has repeatedly meddled in Russian politics, “especially aggressively” in the 2012 presidential elections, President Vladimir Putin told Oliver Stone, while dismissing allegations that Moscow hacked the US elections as lies from Trump’s opponents. 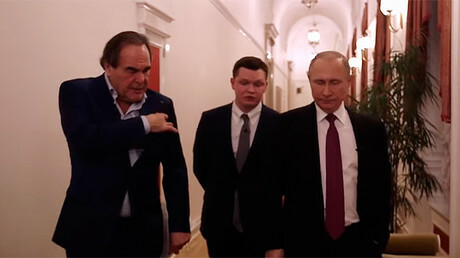 In the final part of US filmmaker Oliver Stone’s documentary series, Putin Interviews, which was aired on Showtime on Thursday night, the Russian leader told the Oscar-winning director about how Washington has attempted to interfere in the Russian electoral process through US diplomatic staff and by pouring money into NGOs. “[They did it] in 2000, and in 2012, this always happened. But especially aggressively in 2012. I will not go into details,” Putin said, adding that all of the other post-Soviet republics have also been subject to US meddling. As one of the most glaring examples, Putin pointed out that US diplomatic workers had actually campaigned for the Russian opposition. “They gathered opposition forces and financed them, went to opposition rallies,” the Russia leader noted, adding that he had broached this issue with members of the past administration, including former US President Barack Obama and former Secretary of State John Kerry. Engaging in the power struggle within Russia runs contrary to the role of diplomats, which is to “establish interstate relations,” Putin argued. Another tool the US uses to project influence is NGOs, which “are frequently financed through a number of layers and structures either from the State Department or some other quasi-governmental sources,” he said, adding that Washington employs the same interference strategy all over the world. Putin said he had read the US intelligence report alleging Russia’s involvement in the US elections and found it superficial, as it lacks concrete details and is based on speculation rather than hard facts. Putin stressed that Russia has not carried out cyberattacks targeting the infrastructure of other countries. “We have not engaged in any cyberattacks. It is hard to imagine that any country, including a country like Russia, could seriously influence the electoral campaign and its results,” he said. When asked whether a “secret war” was underway between Russia and the US in the cybersphere, the Russian president simply said that for every action, there is always an equal and opposite reaction. The Russian president admitted that it had taken some time for Russia to grasp the threat to its cybersecurity that had come with the hardware and software it procured from Europe and the US soon after the collapse of the Soviet Union. “Since the early 1990s, we assumed that the Cold War was over. We thought there was no need to take any extra security measures because we were an organic part of the world community,” Putin said, adding that now Russia is “taking certain steps” to reclaim its technological independence.